DUMBARTON snatched defeat from the jaws of victory at Glebe Park, Brechin, losing 3-2 to Brechin City after leading 2-0. The hosts enjoyed more of the early possession and pressed tight when Sons had the ball. But it was the men from the Rock who struck first. On 18 minutes Bobby Barr clipped the ball cleverly over the keeper and into the far corner of the net for 1-0, after Michael Paton's cross missed everyone else. Paton took a knock shortly afterwards and was replaced by Ross Forbes. Most of the pressure was coming from Dumbarton at this stage. After the break Sons went 2-0 up on 56 minutes with a superb strike from 22 yards by the trialist who had replaced an injured Stuart Carswell (pictured). But Brechin hit back almost straight away, as Boris Melingui twisted in the box and drilled the ball low below keeper Grant Adam to make it 2-1. On 76 minutes the home side were level. Callum Tapping controlled the ball well before smashing it hard and low into the net. 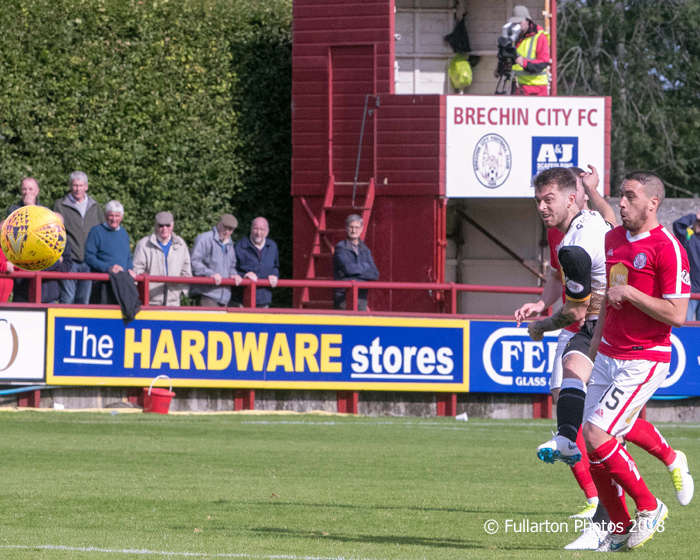 Then in time added on Melingui grabbed all three points for Brechin as he slipped in to fire in for 3-2 seconds before the final whistle.